The Universal Periodic Review (UPR) is a process conducted by the UN Human Rights Council to review the human rights situation in every UN Member State. The UPR sends out the important message that all countries can improve the way human rights are promoted and protected. More information is available on the UN website. The UK was recently assessed for the third time under the Universal Periodic Review. As part of our role as a National Human Rights Institution (NHRI), we submitted a report to the UN outlining the major issues facing Britain today. It found that, despite some improvements on issues such as stop and search and modern slavery, there were areas where progress is required. The report sets out 30 recommendations to the UN, many of which were voiced by Member States at the Human Rights Council. At a meeting of the Human Rights Council in September 2017 the UK took receipt of 227 recommendations for improvements to its human rights record. After the review, the Commission wrote to the Ministry of Justice, asking the UK Government to set out its strategy for implementing the UPR recommendations. Read our report Protecting human rights: key challenges for the UK's third Universal Periodic Review or watch the British Sign Language (BSL) video of the report on Vimeo (external link). Each UPR is conducted by the Human Right’s Council’s UPR Working Group which is made up of all 47 members of the Human Rights Council, though any of the UN Member States may participate in the UPR. Through the UPR, Member States assess the human rights situations of every country once every five years. They use evidence from a wide range of sources, including a report from the state under review and independent assessments from UN treaty bodies, National Human Rights Institutions (like the Commission) and non-governmental organisations. Member states then make recommendations for further progress in an ‘outcomes report’. The report includes a response from the state under review saying whether it accepts the recommendations or not, often with an explanation of this position. The state is encouraged to submit a progress report at the midpoint of the five year reporting cycle. We will work with government and civil society organisations over the next five years to work to implement these recommendations. How is the UK performing? The UK has been reviewed three times through the UPR process. Its last UPR took place in May 2017. 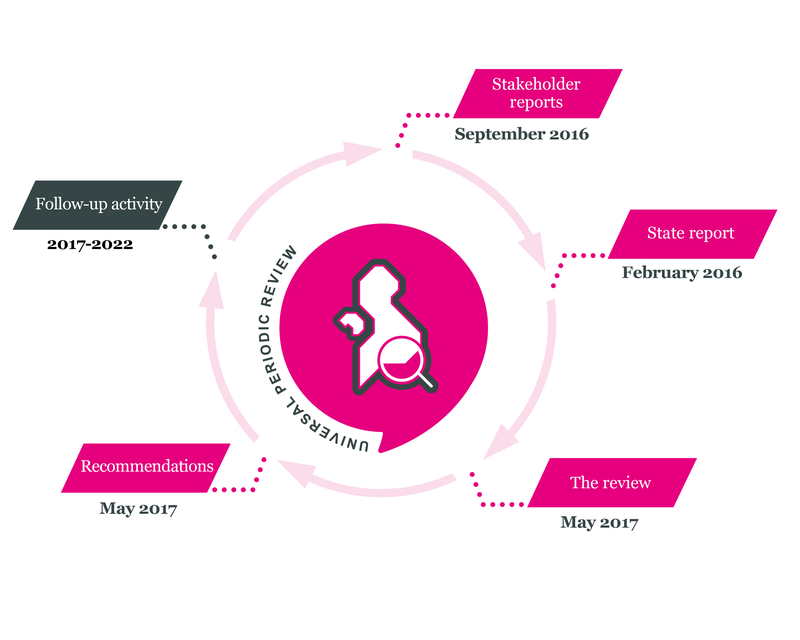 The full list of 227 recommendations received was published in September 2017. The UK Government also published an explanation of its position on each of the recommendations. As part of this process, the UK Government submitted a report which set out the major human rights challenges and achievements of the last five years. The Commission submitted to the UN its own independent assessment in September 2016, and supported the British Institute of Human Rights to produce a submission from a coalition of civil society organisations. A full list of ‘shadow reports’ such as these can be found on the UN’s website. Now the third cycle recommendations have been adopted at the Human Rights Council, we will be working with the UK government to encourage their implementation. The UN Human Rights Council expects states to consult NHRIs and non-governmental organisations (NGOs), charities and interest groups on the recommendations received in order to form a UPR implementation plan.